Kidz 21-Piece Master Jump - Stunt Driver Set Just $5.99 Down From $12.00 At Sears! You are here: Home / Great Deals / Kidz 21-Piece Master Jump – Stunt Driver Set Just $5.99 Down From $12.00 At Sears! Kidz 21-Piece Master Jump – Stunt Driver Set Just $5.99 Down From $12.00 At Sears! Sears has this Kidz 21-Piece Master Jump – Stunt Driver Set on sale for $5.99 (Reg. $12.00)! Plus you can get FREE shipping with any $35 order. 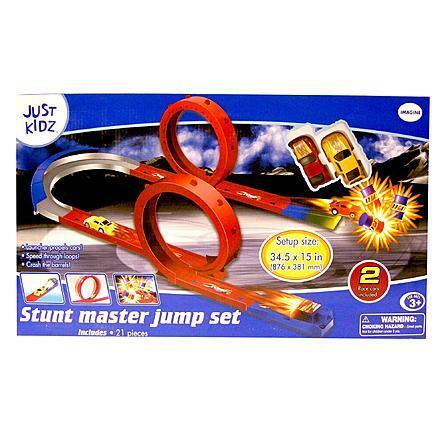 Just Kidz 21-Piece Master Jump Set includes 2 plastic pull back racers. Set up size is 34.5″ x 15.5″ when fully assembled.